The dog days of summer has just about ended. The days are getting shorter and there is a nip in the air. Some of us are glad to see fall come around. I still long for the fresh produce that my garden gave me. Unfortunately I have pulled all my cucumber, tomato, green pepper and squash plants. They are replaced with my fall harvest. There are collard greens for as far as the eye can see. Although my collards are not ready to be harvested, I still yearn for my summer garden. I have canned my summer harvest, to enjoy during the long lean winter. I have tried to preserve them while they were in season and at the peak of flavor. I have one or two recipes still left from when my garden was in full swing. While I do love the cooler weather, I will always long for my summer garden. If you don’t have homegrown cucumbers, it is perfectly acceptable to use the hot house variety. What ever you do, make it from your heart. 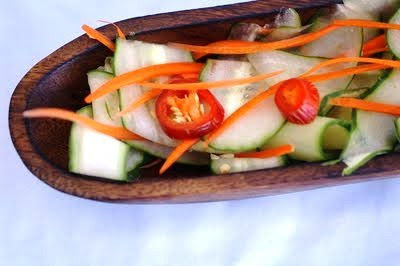 Cut cucumbers very thin with a vegetable peeler. Slice Carrots into match stick slices. In a small bowl add salt, vinegar, garlic, and chili pepper. Pour over cucumbers and carrots. Toss to combine. Refrigerate for three or more hours before serving. Squeezing the last gasps out of summer. As much as I enjoy fall I really should have closed y bedroom window last night it was a little chlly this morning. This recipe represents your garden very nicely! So simple and lovely. 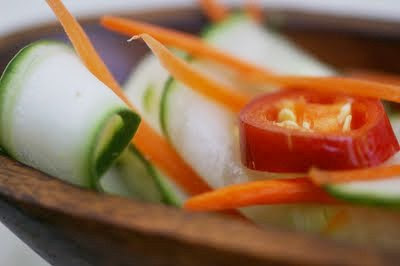 Fresh vegetables just can’t be beat! This sounds like a wonderfully refreshing salad. I love Oriental flavors and it sounds delicious with these veggies! I know what you are saying…I miss all my garden plants. It seems like just yesterday I was planting them all and now they are all gone. I do love Fall however. This looks delicious! I still have a few summer vegetables left. I’ll have to make this soon before they are gone though! Hubby loves cucumbers. I which we had been able to grow some this summer. I am saving this to my archives for next summer. This sounds awesome (and it is so beautiful)! Such a beautiful salad! 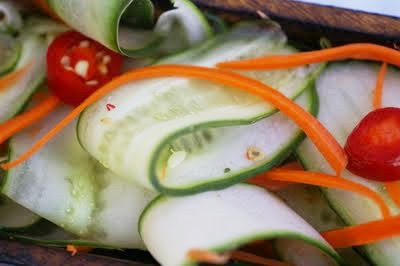 Love how you sliced your cukes~ Have a great weekend!